The term ‘Big House’ in Ireland refers to large, luxurious country mansions of varying architectural styles which were built starting around 1690. The owners who commissioned them were the Protestant ascendancy who had received lands after the Cromwellian invasion. Strokestown Park House (on the photo below) is a typical example for these mansions, one of about six hundred that are left out of 6,000 or so back in the day. Today it is run as a museum. A visit is well worthwhile as all the original belongings of the owners are on display giving a very authentic feel. The Mahon family, (later Pakenham-Mahon through marriage) owned and ran Strokestown Park House and estate for over three hundred years. The original owner, Captain Nicholas Mc Mahon, was given lands by Cromwell in the 1660ies as reward for services in the Cromwellian army taking part in conquering Ireland. He had been the Captain of a cavalry unit in Lord Mountrath’s brigade. His great-grandson Maurice Mahon acquired even more lands making Strokestown Park an estate of some 11,000 acres. 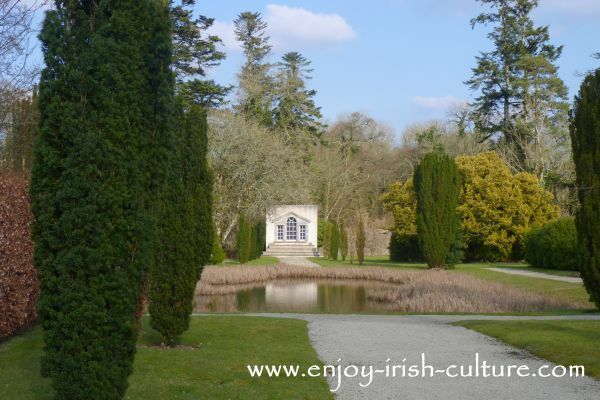 Walled gardens at Strokestown Park House. Strokestown Park House was one among thousands of great houses built shortly before mid-eighteenth century. The build was commissioned by Thomas Mahon, MP (1701-1782).the design is that of a Georgian Palladian mansion, a popular style at the time displaying the wealth of the landowning family. 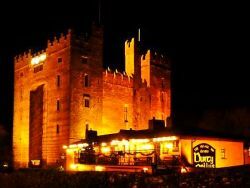 The big house was built on the site of a Norman castle that belonged to the previous landlords- the O’ Conor Roe Gaelic Chieftains. The remaining parts of the tower house were incorporated into the mansion when it was constructed. When you visit Strokestown Park House, look out for the traces of the castle: In some places the mansion has very thick walls and deeply set windows. 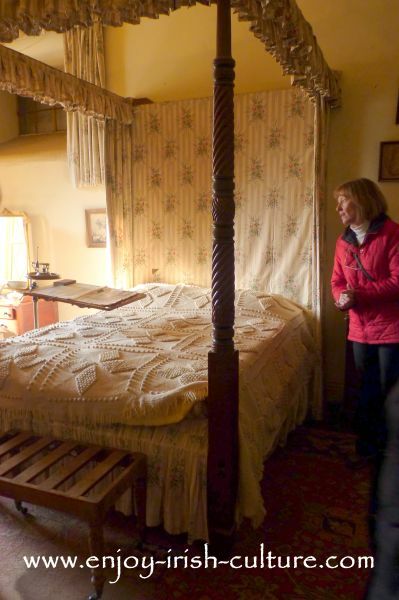 Gentleman's bedroom at Strokestown house. The estate earned income from the export of agricultural produce, such as oats, live pigs and cows. Irish agricultural produce was largely for export and provided food for the large cities in England. There was rental income from lands rented out to tenant farmers. An additional income was Thomas Mahon’s seat in the Irish House of Commons which he held from 1739 until his death. Overspending started however in the second half of the century, and gradually the estate became indebted. Denis Mahon took over in 1845 when Strokestown was already in a lot of debt. Together with an estate manager he made some controversial decisions in an attempt to save the estate. As a result of public sentiment, he was murdered in 1847, probably by some of his own tenants. His daughter Grace Catherine had married Henry Sandyfort Pakenham just a fortnight before her father was murdered. She vowed never to return to the house and never did. However, the alliance between both families more than doubled the acreage of the estate and saved Strokestown financially. As a result of the alliance, the estate remained powerful until the end of the 19th century. 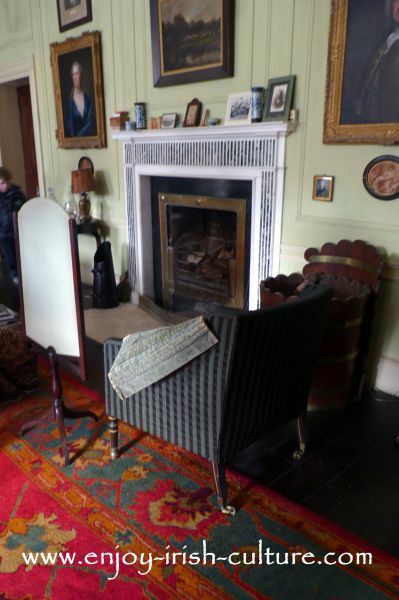 The drawing room at Strokestown House. The last owner and resident was Olive Pakenham-Mahon who lived in the house until 1981. At this stage, the house was in a bad state of disrepair with water running down the walls in some of the rooms. Finances were tight. Over the last few years, Olive lived mostly in the drawing room. One day in 1979, she had a visit from a neighbour, Jim Callelly. He was interested in acquiring a few acres of land as his company, The Westward Group, were running out of space. Olive was in her eighties already. She told him she would sell lock, stock and barrel if he was interested. Jim reluctantly agreed and an agreement was drawn up whereby Olive and her husband could remain living at Strokestown for as long as they wished even though the house was officially sold. Jim’s intention was to keep the land, and to sell the house when the time would come. Olive moved to England in 1981 and died there the following year. When Jim went to the house for a first visit as the new owner, he had an experience that would shape his future. He came upon some family papers dating back to the time of the Irish famine. This house, he thought, was too important, and too much steeped in Irish history to just be sold on privately. What followed was a costly and painstaking, privately funded reconstruction project, the result of which is the big house we can visit here today. 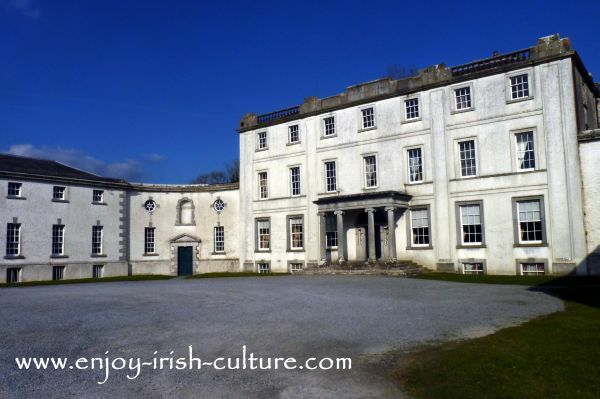 Hi there, hope you enjoyed this page on country mansions in Ireland! If you did, and if you like the content we provide, why not tell the world of social media about our website so that more and more people can enjoy it. Return to 'Irish Big Houses And Revival Castles'.